Noor Haslina Yusoff joined the College of Commerce and Business Administration, Dhofar University as an assistant professor in accounting on 15 October 2017. 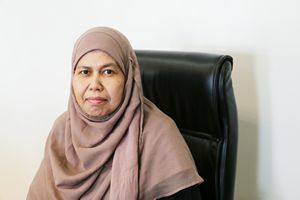 Prior to coming to Dhofar University, she was an associate professor at University Kuala Lumpur, Malaysia; Al Yamamah University, KSA and University of Science and Technology, Yemen. She teaches courses in accounting and financial management and has more than twenty-five years of experience in teaching graduate and undergraduate students. She completed her PhD in 1999 in the area of Accounting and she is a registered member of the Malaysian Institute of Accountants since 2001. Her area of specialization is accounting and her research interests are management accounting, auditing, financial management and teaching and learning in accounting education. She has involved in a number of consultancy and research projects, including as team auditor in the AlYamamah University to achieve the National Commission for Academic Accreditation and Assessment (NCAAA), KSA; trainers for Accounting and Management trainings and consultation programs at the Dhofar Power House in Salalah, SOA; lead auditor for Operational and Assets Management Audit at University of Science and Technology Hospital in Sana’a, Yemen; leader for a project to develop ICT awareness programs and human development contents in the social responsibility portal for children of the poor and needy families in Malaysia (fund granted by the Ministry of Science, Technology and Innovation, Malaysia; consultant in the Information Strategic Planning and Facilities Management at Madinat Al Rawdha Project for Radiance International Consortium; team auditor for Facilities Management and Operational Audit in UTHM; team consultant for Industrial Skill Enhamcement Programs organized by the Ministry of Finance, Malaysia, MSC-IH Business Plan organized by Multimedia Development Corporation Sdn Bhd, Malaysia and task force member in Financial Restructuring and Information Strategic Planning and Manpower Planning in Radicare (M) Sdn Bhd. Currently, she is the lead researcher for the feasibility study on Fully Privately Run Public Schools for the Ministry of Education, Malaysia. The study will complete in March 2018. All accounting courses for undergraduate, graduate and post graduate students. 2013-2014:Team Auditor in the AlYamamah University to achieve the National Commission for Academic Accreditation and Assessment (NCAAA), KSA. 2011:The Acceptance of Computer Usage Among Children – Grant from the Ministry of Science, Technology and Innovation (MOSTI), Malaysia. 2010:Operational Audit in University of Science and Technology Hospital, Sanaa, Republic of Yemen. 2009:Developing ICT awareness programs and human development contents in social responsibility portal for children of the poor and needy families in Malaysia. Fund granted by the Ministry of Science, Technology and Innovation (MOSTI), Malaysia. 2008:Information Strategic Planning and Facilities Management in Madinat Al Rawdha Project for Radiance International Consortium. 2005-2007:Industrial Skill Enhancement Programs organized by the Ministry of Finance, Malaysia. MSC-IH Business Plan organized by Multimedia Development Corporation Sdn Bhd.